Learn About Options for CollaborationThe Fab Lab is participating in the Digital Innovation and Leadership Program (DILP) grant. UI Extension units and groups, including 4-H educators, event organizers, SPIN clubs and other associated individuals can contact us to collaborate. Please start by signing in and introducing yourself to a staff person or volunteer . If you’re completely new to makerspaces and digital production start with a tour and try creating something simple, like a laser-cut key chain, sticker or small embroidered patch. If you have a specific project in mind just ask a staff person. They’ll help you find the right people and resources to begin. Additionally, you guide yourself and work at your own pace with the links below. Not Sure What the Fab Lab Is? Still confused about what the Fab Lab is and what we do? 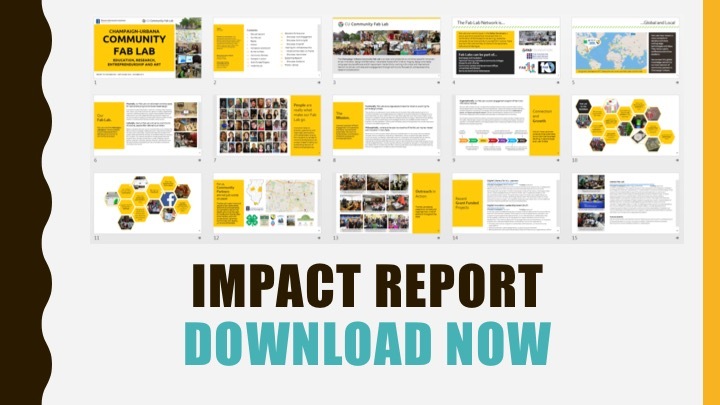 Perhaps some striking visuals and showcase examples can better tell the story: download our book by clicking the image above. 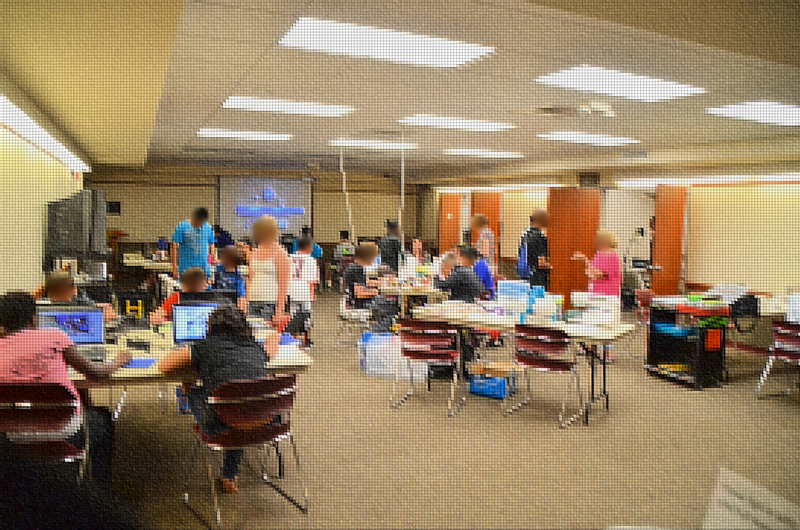 One of the easiest ways to get started at the Fab Lab is to attend one of our weekly orientations. They typically explore a specific activity within a general tool area and cost less than $5 – and participants always get to go home with whatever they’ve made! Please feel free to donate spare materials and tools (just ask a lab attendant). You can also pay for soda by putting cash in the snack box in the textiles room. 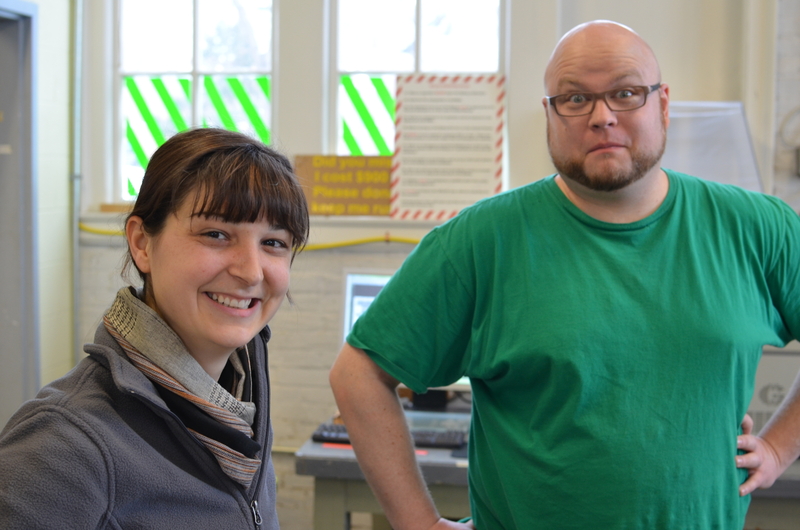 We depend on volunteers to help make sure our Fab Lab is a community-oriented space. After patrons have visited a few times they are welcome to get involved as a volunteer. Interested in starting your own Fab Lab? We’ve assembled some resources to help guide you through the process. This includes small community-oriented operations under a tight budget as well as larger institutions seeking to equip and staff a professional facility.